Book Reviews, Executive Summaries & Recommended Reading to help you on your journey. Lindsay Herbert is an Inventor & Senior Technology Leader at IBM. Having led many innovation programmes with organisations worldwide, Lindsay’s book has received international praise for being the first practical ‘how-to guide’ for achieving real business innovation on a major scale. 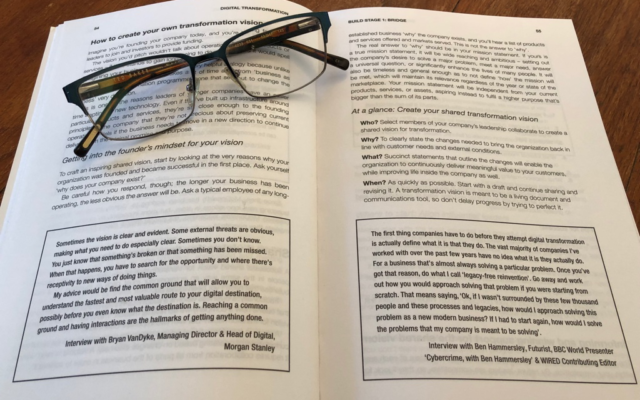 Read this Executive Summary and learn from Lindsay’s BUILD model how to deliver digital transformation success in five stages. This is a great “how to” guide for making driving Digital Transformation in organisations. Lindsay Herbert has based this guide on many interviews with “C” suite executives at a wide range of organisations (for profit, not for profit, academic institutions) and on her years of experience with the subject matter. What is it really and is it worth the effort? Vision and implementation are inseparable: executing on the “Why” of your business is fundamental. “Why” delivers the critical changes you need to make. Real Digital Transformation creates an adaptive organisation, able to react to rapidly changing external environments using new processes, technologies, ways of work. Output includes increased competitiveness, revenue and market share. Digital Transformation is a cliché. Beware as it means very different things to different people in the organisation and beyond. Common challenges facing Digital Transformation include Staff and Mid-level Management resistance, loss of revenue from non-digital customer segments, customer experience inconsistencies. Organisations need transformation as gaps have formed in serving external customers what they want in the way they want. All the organisation’s people are important and Senior Leadership support is vital to advance the transformation. Create a shared Transformation Vision and ensure all projects in the Transformation support the Vision. The vision will describe your organisation’s future success in contrast to what it is doing today. It will capture the biggest areas of change needed and inspire people to address the changes needed in the organisation. To transform; first, understand what is needed to bridge the gaps between your organisation and the people it is meant to serve. Then uncover your organisation’s hidden barriers, assets and resources that will build your route to transformation. Then build projects and iterate in short cycles, test with real users, make changes and iterate to the next cycle. Leverage successes to gain greater access to resources and scale up. Disseminate new ways of working to ensure they become the new business as usual. Transformation programs must comprise a number of small projects that tackle People, Processes, Platforms, Partnerships. Enable small, short cycle transformative projects that can really contribute to the vision. Test early and often. Run as many projects in parallel as your resources allow. Transformation often starts in the mundane: a boring small project can be the one that leads to big changes. Starting small encourages people. Small failures are the safest learning tool: change is scary, and we all want to avoid failure. Enable Transformation by setting universal, measurable cross organisational goals with real-time, relevant feedback. Use Agile and Design Thinking: Agile will allow a cross-functional team to plan design and build complete versions of a product in each stage of a project. Design Thinking will keep the customer at the centre of all you do. Use Labs, Hubs, Accelerators as enablers. Leverage success from small projects to scale up to other areas and to attract the best people. Scale up to big, bold cross organisation projects. 1 – Digital Transformation – What is it really and is it worth the effort? “We need a major budget for a Digital Transformation to be successful”: Some of the most successful had low budgets. “We have consensus within our organisation on what Digital Transformation means” Real-world evidence shows that this is far from the case. “Business will revert to Business as Usual after a Digital Transformation”: it is a one-way trip, objective: make an organisation more adaptive to change. Do not assume everyone understands the same thing when they hear “Digital Transformation”. It is a powerful concept, often misunderstood. What does REAL Digital Transformation look like? Digital Transformation is about finding the new ‘business as usual’. It takes the right people with the right attitudes and mindsets to get there. Real Digital Transformation is about the organisation’s ability to be able to react to use new processes, technologies and ways of working. Most organisations are slow to react and bogged down. Real Digital Transformation breaks down the barriers of hierarchical inertia and creates real adaptability. New devices, platforms, ways of working and processes are tangible proof points of Digital Transformation. Digital Transformation increases competitiveness, revenue, market share, lowers customer acquisition cost and enables lower cost. Elements of the organisation to be tackled in a Digital Transformation in the Business Model: how revenue is generated, customer acquisition and retention. Customer Experience: core products, how customers engage. Internal Processes: ways of working, decision making, analysis. Jargon is dangerous as it leads to mistakes. Digital means different things to different groups. For Consumers “Digital” is everything on the internet, modern appliances such as mobile phones, fitness watches and many more. For Businesses “Digital” includes IT infrastructure, communication processes and processes such as HR, Supply Chain and others. For a CEO it means we are doing web site upgrades to keep our investors happy that we are keeping up. For a CMO that we are spending more on Digital Marketing. For a CIO that we are buying a new Customer Management system and for a CFO that we are automating, reducing headcount and moving work offshore to save money. For a Digital Agency that we will develop a new website using “Agile” without preparing you for the ongoing change. In General, it means that we just don’t want to fail like Blockbuster or Kodak by ignoring the inevitable. Digital gave power back to the individual. People can attract and retain customers from their garage. Value is created and held in new ways in a Digital world and it disrupts our old hierarchical way of doing business. Think Uber (a taxi company without owning a car), Airbnb (the biggest hotel chain in the world but owns no hotels). In addition, transparency means customers have more powerful than ever, Social media can trash your reputation in a day. Knowing who your customers are and what they expect in a digital era is vital. In Business to Business organisations, your “customers” are the many people who interact with your organisation, not just the decision makers in the Business you sell to. Change is an unnatural act for most of us, particularly change as a constant. We like the idea of change but not the effort and risk involved. The challenge is changing attitudes towards change itself. Staff resistance – caused by fears that machines may do their jobs or offshoring or younger Digital Native employees. Mid-level Management resistance – caused by a perceived threat to autonomy and power. Loss of revenue from nondigital customer segments – this could be the segment of customers engage with you in a non-digital way. I.e. those who will only interact face to face. A Decrease in productivity – as we divert resources to a Digital Transformation, business as usual can suffer. Staff and Customer Experience inconsistencies – some areas may obviously lag as others may move forward and this can become obvious to customers. Focus on the “why” not the “how” of your business when setting the target of your Transformation program. Be clear on the target of your Transformation. Target it to transform the “Why” of your business not the “How”. Blockbuster doomed their transformation by prioritising its Business Model. Blockbusters mission was “to provide customers with the most convenient form of media entertainment”. This failed as customers switched to online purchasing such as Netflix. Focus on relating your transformation to the why not the how. It is easy to be complacent when you own a market, courage is needed as you may have to give away some of your revenue to stop the aggressive new-start chipping away at your market. Bridge: Bridge the gaps between your organisation and the people it is meant to serve and the changes happening. Uncover: uncovering your organisation’s hidden barriers, assets and resources that will build your route to transformation. Iterate: Build in short cycles, test with real users and then make changes and iterate to the next cycle. Leverage: Leverage successes to gain greater access to resources and scale up. Take successful Iterate solutions to scale. Disseminate: Disseminate new ways of working and processes to make the new way business as usual. Real transformation does have to be driven from the top. Digital Transformation gets underway and noticed once some successes have occurred. So, it is not solely the Senior Leadership who are important to advance the transformation, however, transformation will not be sustainable without Senior Leadership support. The reason you need transformation is due to the gaps that have formed internally in serving your external customers. The purpose of Bridge is to close the gaps that have formed between you and your customers. Customer engagement stops internal politics taking over – it is impossible to argue against the market reality and what customers are saying. Decisions can be based on what customers want and demand rather than internal political imperatives. The reason you need transformation is due to the gaps that have formed internally in serving your external customers. Gaps cause difficulty for organisations due to the speed and flexibility that Digital has enabled in the market and that organisations need to adapt too. External: gaps between the voice of the customer and Decision makers in the organisation. Internal: gaps between areas of the organisation in serving and understanding how to serve customers. Most organisations have hierarchies and structures that pre-date the Digital Age. Many have Digital skills in one area of the business leading to delay in leveraging those skills to achieve transformation. Create awareness in your senior leadership group of the processes, Business models and technology that Digitisation has made possible. Key leaders need to be aligned, ready to communicate where a shared vision around Digital will take the organisation. Gather insight from the market and from Customers. Swiftly as the data dates very quickly. Get unbiased, external help to undertake the research. Don’t delegate too much to outside help. They will leave you in the lurch when the outside help leaves. Gain insight into the internal structure/nature of your organisation. Find out how the external gaps formed in the first place. All organisations form to serve external needs. Gaps could have formed because the organisation has acted to satisfy shareholders and the analysts rather than customers. Or (for example) a University that has acted to satisfy academic staff rather than students. Organisations already adapt to external conditions. An example is a clothes retailer adapting to fashion trends. Digital Transformation demands more of the organisation. The clothes retailer must now adapt to designers selling clothes directly to the public via online shopping. Failing to align to changes in external circumstances is the root cause of the need to Digital Transform. Your customers expect more because others raised the bar using Digital Technology. And this will not stop, it will only get more disruptive. On Demand Amazon I get what I want when I want. Real Time Google Information is accurate up to the minute. Unique Air BNB Only I get this exact experience. Personal Netflix What I buy is tailored to my lifestyle. Local Uber Tailored to my specific area. Effortless Apple What I buy will work, easily. Researching customer and consumer needs is the foundation stone for your external gap analysis. Who: Involve Senior Leaders and Employees who engage with customers. What to do: Form meaningful engagement with customers to find out what they need and value. Why: Give the organisation direct experience to what customers want and value. When: Allow enough time to engage customers along each stage of the customer lifecycle. How: conversations with real customers. Investigate/prioritise customer needs and pain points. Identify new business models from customer needs and revenue streams. Build ongoing ways for staff and senior leaders to engage with customers and react to insights gained. Does current customer experience match our market promise? Does our existing digital estate address current customer needs? How have customer needs changed since we established our current processes? What experiences are preferred by customers with the sector and outside? How can we use the elements of those current experiences to deliver better value to customers and our business? Undertake secret shopper trips of your organisation. Interview and converse with customers. Host events where customers can discuss with you in open forum. Experience the digital products and processes that customer use. Recruit customers to diarise end to end interactions with you. Observe customers in your environment, your competitors and other segments. Spend time in customer-facing roles. Facilitate discussion of customers who are in similar segments. Provide customer-facing staff with questions to ask questions that can add to data points for research. Pose questions for written responses Digitally i.e. on social media your digital estate and collate the responses. When asking a question don’t lead the response, listen. Do not venture your opinion. Train your people to engage. Quality questioning drives quality research. Assumption is the natural enemy of insight. State assumptions upfront, test them in your customer engagements. Test the opposite of your assumption (the null hypothesis). Real insights never sit on the surface. The root of a problem sits below the initial answers. Drill down. Use ongoing conversations to build lasting bridges. Insights are not a once off, external conditions change rapidly. Ongoing dialogue will prevent gaps reappearing. Establishing hierarchies and standardising in order to be able to scale production are the main drivers of internal gaps. Silos exist between parts of the organisation that means information will not be shared and insights become isolated. In an external environment where customers demand (and receive) mass customisation, instant fulfilment, timely information that often cuts out a middleman and much else, the pre-Digital hierarchy internal gaps. Hierarchies drive inward facing process. The larger the organisation, the more the hierarchy develops in order to maintain central control. Hierarchies are the control mechanism for large organisations. In the Digitally enabled environment, change now happens too fast for hierarchies to be effective. Hierarchies form based on three principle assumptions: first that people at the top are the most informed to make the most important decisions. Second, that change is assessed and implemented across the whole organisation, then the model can revert to business as usual. Finally, that standardised offerings can be developed to meet the needs of nearly all customers. Challenges to Hierarchy and Standardisation in Digital Environments are that change now happens too fast for those at the top to assess or even know about it in a timely manner. Also, change does not happen evenly, and different customers will have different needs, even in the same sector. Next Localisation and personalisation are easily achieved via Digital Technology and standardisation is a dated outcome. Finally, problems will emerge in multiple ways giving rise to differing views of root cause and thus differing ideas of what to do and not knowing where to start gives longer delays and inaction. Who: Involve Senior Leaders and Employees who engage directly with peers in similar organisations. What to do: Form meaningful relationships with employees in peer organisations to understand what is and is not working in Digital Transformation. This engagement may include skills and job exchange. Why: Give your organisation’s people insight into what can be achieved with Digital Transformation and the urgency. When: Allow enough time for key members of staff to gain insights. How: Best results are via short term collaboration with peers, consultants and others outside your organisation. Gather evidence of successful case studies that articulate why and how your organisation needs to transform. Gather examples of technologies that can help you and those that can damage you if used by a competitor. Gather examples of new business models, ways of working. Benchmark your organisation against peers and competitors. How are competitors meeting customer needs better than you right now? What business models or ways of working would be useful that you could leverage through digital technology? How have competitors and peers adapted to circumstances shaped by new expectations? How are competitors meeting customer needs better than you right now? What technology could add business value for you or enhance customer experience? What Business Models or ways of working would be useful that you could leverage through Digital Technology? Speak at and attend conferences for Digital Professionals. Connect senior leadership in your organisation to peers in more Digitally adapted organisations. Invite Technology experts and peers in more digitally advanced organisations to give talks/working groups in your organisation. Facilitate skills exchanges and job shadowing with more advanced peers. Create small projects that encourage collaboration with peer organisations that are more digitally advanced than you. Write a good brief for the expert, poor briefs = poor outcomes. State your overall objective AND invite their input. What you are trying to achieve and why. Start small and be specific. Suggest a first step and timeline. Set realistic expectations. State if you are going to others. To kick off we need a clear statement of what the transformation will achieve and have senior leaders aligned and involved. And we need a team to do it. Who: Leaders and Managers across different functions and customer-facing staff. What to do: Articulate the reason your organisation needs to transform by presenting an evidence-based vision. Why: To win support, move ahead with a few small initiatives. When: Allow enough time to get one or two projects underway. Identify gaps in the internal organisation that are stopping the organisation from adapting to external environment demand and condition changes. Identify answers as to how the organisation would deliver to the new external demands and conditions if it were founded today. Capture a “before and after” statement of what will occur as a result of Digital Transformation. This is the vision. Align selected leaders to rally around the vision who can help implement and influence implementation of the vision. What would our organisation look like if it was founded today? What relationships should exist between staff and departments to deliver to current customer needs? What processes would need to be in place to react and adapt to changing external needs and conditions? Which functional leaders across the business have the influence and power needed to kick of the initial projects? Identify champions early and use their willingness and enthusiasm to persuade others. Do not try and convince nay-sayers at this point. Only share the vision with a small group at this point. Share with those people you need right now. A vision calls out what needs to change internally to meet external changes and is shared and understood by those who need to implement it. Get into a “Founders mindset” to create a vision. Ask why does your organisation exist? If you have a true Mission Statement that should give you most of the answer, it will be timeless and be independent of your product stable, processes and business model. Involve select members of your organisation’s leadership team to create the vision. Describe your organisation’s future success in contrast to what it is doing today. It will capture the biggest areas of change needed and inspire people to address the changes needed to change the organisation. If your organisation was founded today, how would it be set up to best deliver to current External demands? How is success measured for each area of your organisation? What are the common causes failures, losses and inefficiencies exist today in your organisation (by area)? Which internal measures of success are at odds with great customer outcomes? How are decisions made/measured across the organisation? What decision-making processes are at odds with external conditions? What is the cross over points in the organisation’s current processes that lend themselves to improvement via Digital technology? Understand the personal goals of each leader you want to recruit to create the vision. This makes the vision relevant to their context. Individuals have their own area to run, they are measured, and their primary goal is to achieve those measures. Understanding their motivation first and tailor your recruitment to meet their needs. Start with the most powerful leaders in the organisation. Explain fully, people bluff their knowledge about Digital Technology. Use the “Shared” formula in creating your vision (below). A vision must be succinct, human-centric, aspirational, relatable, evidence-based and decisive. S = Succinct: make it short, cover why and what benefits it will give customers and how to do it. H = Human-centric: do not include business metrics, technology. Relate it to human needs/wants. A = Aspirational: transformation takes years, so the vision needs to set a high bar. R = Relatable: anyone in the organisation must be able to relate to the vision. E = Evidence: that supports why change is needed what benefits we will get. D = Decisive: unambiguous about why change is needed. Best use a “before and after” for this. Why now? What’s different now that makes change essential? What’s at stake? What will we gain or avoid losing? How do we need to change? Think current vs transformed. What does it do for customers? How does it change customers lives for the better? How will it change lives for the better inside the organisation? The two most important jobs at the beginning are freeing up staff time from business as usual and removing barriers put in place by senior leaders. The team needs: Sponsors: have the power/resource to drive transformation efforts. Champions: those in leadership roles who understand the need for change and can free up time and resources to help. They must be influencers as they are your advocates. Change agent(s): A person or people who will drive the transformation agenda. Successful change agents are compelling; have a strong presence and can win people over. They have a great internal network and are connected to external experts. They are up to date on technology and what peers and the competition are doing. Every major program needs a strong leader to drive it along and maintain momentum. They must be at the right level of seniority to be able to drive other senior leaders. They will present an answer to the program at all major meetings. They will remove barriers and drive transformation, keeping it in the spotlight and front of mind for the broader organisation. Successful change agents are compelling; have a strong presence and can win people over. They have a great internal network and are connected to external experts. They are up to date on technology and what peers and the competition are doing. They can solve big problems creatively. Finally, they are committed to having the resilience to weather storms and be calm. You should be able to find one in your organisation. In the rare situation where you cannot, recruit one. When you do recruit a Change agent, pay them well, don’t expect them to stay (that is why they are good at change) and anticipate quiet sabotage from others. The uncover stage shows you how to structure your Digital Transformation. Internal problems are hard to see from within your organisation and Uncover is all about fleshing out the barriers to Digital Transformation. Barriers are in the organisation’s people, processes, business model and technology. We are often blind to our own inefficiencies causing us to fall behind and prefer to blame external change. Don’t let ambition outstrip available assets. Start small. Leverage Champions, your most powerful assets at this stage. Don’t try to plan the whole Transformation in detail at this stage. Processes: all aspects of operations, including internal and external transactions and ways of working. Platforms: IT capability – networks, platforms, digital presence. Who to involve: members of the Transformation leadership group with leadership from the Change Agent. Why: To ensure transformation plans include plans to eliminate barriers. When: This can be done in a single workshop. Identify the biggest barriers to achieving the vision goals. Evaluate barriers broken into people, process, platform, partnerships. Why hasn’t the organisation adapted naturally to keep pace with customers and environment? What are current attitudes towards transformation/innovation? What attempts have been made to transform in the past? What succeeded/failed in the transformation attempt(s)? Why did the successes/failures in past transformation occur? What areas of the business have the most barriers? What areas would benefit most from transformation? Barriers are the things that cause frustration. Start at the top of the organisation and work down. Attend team meets, observe people working in various levels/parts of the organisation. Question what you observe, why are things been done in a certain way? Engage with leaders in the organisation using material gathered in “Bridge” stage to discuss how things could be done differently based on other organisations. Invite consultants, peers and digitally advanced organisations to present to the organisation and gauge leader and staff reactions. Interview new employees to see what frustrates them compared to their prior organisation and why. Facilitate workshops with people from across the organisation using the Transformation to find out ways the effort could succeed or fail. Political interests, agendas and motivations will need to be engaged with and understood. Organisations that grow via acquisition end up with a mish-mash of systems, processes, cultures. Digital Technology will not transform the organisation alone. People make that happen. If people do not have the capability or motivation to make the transformation happen, then it will not happen. Political interests, agendas and motivations will need to be engaged with and understood. People become barriers to transformation by Missing the innovation mindset: one that is prepared to take risks and sees failure as learning. Providing incentive and tools to innovate can help here. Operating with false logic – this is where the logic is reasoning is outdated and cannot see the new challenge. Poor accountability – if there are misalignments between the way people are linked to organisational outcomes. If people are not measured on anything tangible or measurable, they will be able to create barriers without consequence. Open: are the influential people in the organisation open to new ways of working? Adaptable: do people cope well with change? This includes self-development. Accountable: are people at all levels held accountable to outcomes that are impactful for the organisation? Uncovering the way processes works can be looked at in categories: Functional: processes that facilitate internal operations and external transactions. Decision making: rules/methods that trigger decisions. Ways of working: ways used to achieve business outputs. Too much consultation: this will drive progress to a halt, too many sign-offs or meetings needed. Lack of automation: this can make activities impossible to measure so we do not know how well work is being done. It doesn’t just slow process, worse it makes efficiency invisible. Too much internal competition: pitting teams against each other holds back innovation because the real measures of success are external, not internal. Also, humans will seek the easiest way to fulfil needs so if you are measuring staff against each other, it means that you only must beat the other guy, not necessarily perform well enough. Creating internal competition ensures you a lack of internal knowledge sharing and teamwork. Review which processes do not meet the requirements of a good process. Is the process providing benefits to users in ways that contribute to the success of the organisation? Does the process meet/exceed industry best practice? Can process inputs and outputs be measured? Is the process providing benefits to users in ways that contribute to the success of the organisation? A platform is a group of IT technologies that act as a platform for one of the organisation’s key functions or processes. Analysing: processing, interpreting and calculating any input to produce a pre-determined output. Learning: weighing outputs from past analysis to improve future outputs. Managing: controlling and monitoring of any process. Storing: collecting any kind of input for future use. Systems of Engagement, eg. Customer Management system: function is to share and manage Inflexibility, incompatibility and not user-friendly. Systems of record, eg. organisation databases: function is to store/receive. Isolated, cannot receive from other systems, poor searchability. They can be hard to learn, slow to build on (new releases) and slow to work (response time). Overly complicated and under-delivering. And finally of restricted scope and scale (cannot expand). Fast: can the platform process quickly? Can staff customise/change/upgrade easily? Accessible: is the platform easy to use? Is there training available? Clever: can the platform reliably collect data to give useful insight and outputs? Extendable: is the platform able to connect easily to other platforms, networks and devices? Partnerships are a major enabler of external change. To form, maintain and track meaningful external partnerships there need to be roles in your organisation that have this as their accountability. Timely/short term: a market opportunity arises; two organisations collaborate to capitalise on an opportunity. Capability building: forming a partnership to help an organisation build a capability. 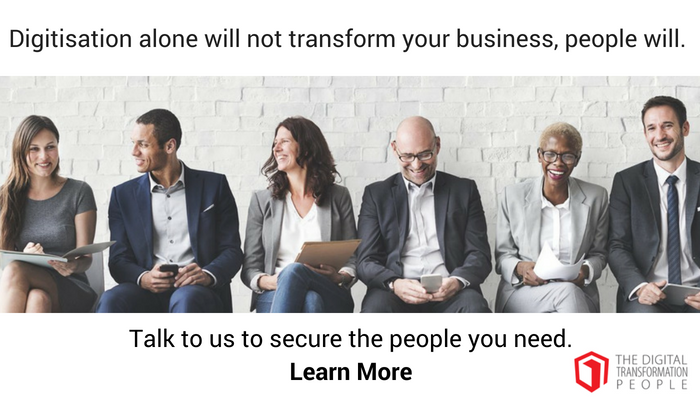 Caution here, you do not want the capability building partner to become too built-in to your organisation or you will be left in the lurch when they leave. Long term value adding: these are the most traditional. When the purpose of the partnership is about building an organisation’s technical capability. Too many partners, no clear oversight – having a plethora of projects with many partners without coordination will create friction. Which to keep, which to close? Pitting partners against each other – drives price down but also trust and work quality. Beware macho cost reduction jeopardising the quality of your relationships. Focussing on deliverables instead of outcomes – there is a difference between a supplier and a Digital Transformation partner. A partner cares about your organisation achieving the transformation, it is not a simple purchase, install and walk away transaction. A procurement style focus on near term deliverables will drive the wrong behaviour. We are about the transformation of the organisation here and that is the outcome that the partner should contribute to. Flexible: is the partnership changeable/renegotiable as needed? Transparent: does the partner share information/resources? Open: are you and the partner ok to engage with other partners to bring in required resources? You can get there by driving individual projects linked to your Transformation vision. Undertaking a series of prioritised projects will deliver results more quickly than a massive program. The routes to transformation will become clear by undertaking Bridge to understand the gaps between what the external customers are expecting and the competitive environment. Undertake Uncover to understand barriers to transformation in your people, processes, platforms and partnerships. Then combine your vision with what you have found via the Bridge and Uncover stages. The prioritised projects required will fall out of this process. Who: Transformation leadership group, leaders for key areas such as IT and external consultants. What to do: Determine the outcomes needed to achieve the shared vision. Prioritise options for achieving each outcome. Why: To provide flexible options rather than a prescribed path. This allows the project teams to find the best path. When: – Start as soon as possible. How: prioritise projects around your organisation’s biggest chances to close gaps bearing in mind the barriers uncovered. Identify the first projects to start digital transformation by improving customer experience. Determine where in your transformation journey you should tackle projects that improve outcomes for people, processes, platforms and partnerships. Identify the right people to form the first project teams. What digital opportunities exist to transform your current customer experience? What are the major barriers to achieving your transformation vision? What are the immediate opportunities to start transforming your current customer experience? What skills and resources are you missing to kick start your transformation efforts? What assets can you use to undertake your transformation efforts in the short term? What are the costs/risks/payoffs for each transformation effort? What do you need to start your first project? Start with Digital only channels e.g. website. This reduces barriers. Evaluate/score your organisation’s current customer experience. Invite pitches from your suppliers and partners to see how they would approach transformation. Customer experience is every interaction your customers have with you, online or offline through every stage of transaction over their entire history with you. This experience will often be longer than you have been at the organisation. This sounds obvious but it is staggering how many organisations become focussed on changing out platforms or implementing Digital technology and quickly lose sight of the main outcome we are trying to achieve: to transform the customer experience. Customer experience is every interaction your customers have with you, online or offline through every stage of transaction over their entire history with you. Gaps that have formed over the years are the reason customers say, “this company does not treat me the way they used too”. The customer has the history and remembers it and that is their experience, not just today. Transform a Customer’s experience by solving their pain points or enabling a desired lifestyle or helping them meet their long-term goals. Solve customer pain points: this is the most effective way to gain traction and gain success in your transformation program. Choose those that can link to a business metric and be measured. Enable a lifestyle – how might your organisation transform the lives of your customers. How can you fit into and enable the lifestyle they aspire to? Facilitate long term goals – reward loyalty. What long term value do customers want in their lives, how can you help? Surviving needs – health, wealth and security. Create routes to transformation that meet surviving needs by helping your customers optimise their wellness, financial outcomes and safety. Thriving needs – freedom, social status and mental stimulation. Create routes to transformation that meet thriving needs by helping your customers improve sense of self, save them time and mental energy and help them look good. Great Governance means having Transformation leadership set goals and objectives for the project teams to meet rather than telling them how to do it. Transparency and regular update to senior leadership will enable success. Right skills and leadership level: you need people with relevant expertise and influence. At project level the needs become specific and you may need to hire specialist consultants. Systems for ensuring transparency: you need to keep the relevant people informed and allow people to see what is going on in individual projects. Transparency is achieved via automated means as much as possible or you will spend your time updating reporting systems and presenting endlessly to stakeholders. Create online space for the team to collaborate and record progress. Use collaboration software as much as possible, for design, project management and other activities. Governance is there to set goals and empower: Empowered teams are fundamental to success for the projects (especially when using DevOps, Agile or Lean processes). Empower at team level and use leadership for goal setting. The right way to manage Digital Transformation is via “Iterate”. Traditional approaches do not work. Traditional management creates individual business cases. This is flawed as the assumptions are unpredictable and Individual Business cases do not stack up. If there is no management then we pick exciting looking projects. This is flawed as there is no underlying vision to link the projects together or create a programmatic approach. Enthusiasm quickly wanes as the initiatives drift along in an aimless way. Who: The transformation leadership group and the project teams who are staffed with people with the right skills and can work in projects that build, test, learn, report and repeat swiftly. What to do: Run several projects at once that will have differing timelines that can regularly be checked in on rather than running one mega project with a mega schedule that no-one understands and pretends is going well. Why: Enable transformative projects that can really contribute to the vision. We can check a Projects regularly and kill it early if it is not contributing to the right outcomes. How: Use Devops and Design thinking methods to engage customers, check in and evaluate. Test early and engage customers using different brands and/or with 3rd parties to prevent brand damage. Locate the project teams in a new space to start with. It shows commitment to Digital Transformation. Be ready to amend the vision and routes to Transformation as you go, as you learn. Flexibility is important. Ensure you have cross-functional teams working on iterative project structures. Experiment with different processes and methods and produce real results quickly. All the time learning new ways. The process is quick Build, Test, Learn, Improve, Repeat. This is instead of lengthy linear Waterfall type techniques. Iterate is cyclical evolving with the needs and wants of customers. So, the solutions do not go out of date. Keep projects on short cycles. Have them on cycles of weeks, not months. An Agile “sprint” for example, usually lasts two weeks. Run as many projects in parallel as your resources allow. Having many projects will ensure some succeed quickly. Keep projects on short cycles. Have them on cycles of weeks, not months. You can even break a major IT project into many small short cycle projects. Stick to the same cadence for all projects as this helps schedule regular reviews and embed the way of work. Set goals for project teams and stick to them. Passes or failures are acceptable in a cycle. No-one’s opinion matters more than the customers. Remember, this all being done to close the gaps between what we do and what the customer expects. Customer Value: Do customers value the output of the project enough to make it worthwhile? Competitive advantage: Is the product offered elsewhere and will it be attractive in market? Business Impact: Can the business enable and support the project output when complete? Technical Feasibility: What is the cost and what is the impact on existing systems? Scalability: Can it be customised, and can it be implemented across the organisation? Prototype or Proof of Concept: simple version of a product or service to test business impact and/or customer experience. A prototype is a design version of a product. It will not function but does show what the product looks like. A proof of concept is the technical development of the product to ensure it will work. Alpha: an advanced prototype. Can be released to a closed group of staff or customers for testing. This allows for real tests of the products from a technical, process and customer point of view. Beta – complete version of a product or service released to a significantly significant number of customers. Can launch without major fanfare to a small number of customers or stores or regions. This deals with final testing and lays the ground for scaling. Beyond Beta – as the new product or service moves on it can continue to grow in terms of market size, segments of customer. Continually test and refine. Spin-off products may emerge. Labs, Hubs and Accelerators: Centralised groups in a space dedicated to use tools to enable Digital Transformation. A way to collocate your best people and tools. Hosting off-site is often done where the organisation is quite conservative. For any of these models to work they must be an interim step and scaling up of the solutions emerging from the Labs, Hubs or Accelerators must be absolutely the next stage and envisaged from the start. Treat these models with caution as they can be seen as irrelevant by the rest of the organisation and seen as a career dead end. Define what they do and what is done with the output carefully. Innovation Lab: Labs create the most cutting-edge solutions to a broad business challenge. They are not there for addressing individual pain points, rather broader challenges such as new revenue streams. Digital Hub: Generally used to upskill staff or fix specific challenges rather than the fundamental work of a lab. Accelerator: Used in conservative organisations or highly regulated organisation and where digital skills levels are low. They are often staffed by specialist agency staff. Internal Start-ups and external Joint Ventures. Internal start-ups are separate from the overall organisation and are given seed funding to get on with the transformation project. Joint Ventures for Digital Transformation has two organisations getting together to meet a significant opportunity emerging from the changes in the external environment. Great goal setting. Do not get distracted by Vanity metrics, those that look great but have little to do with achieving Transformation. Measures that go too granular can reduce the visibility of the overall goal for the team. Always have a benchmark – a start point to compare back too, otherwise, we cannot know progress. Goals must be testable and not open to interpretation – room to doubt or interpret results leaves success open to debate. Typically measures of feelings are untestable. Great goal testing on iterative projects. Test with real, high-value customers – leave no doubt of the truth of the customer view or else senior stakeholders will veto the decision. Reduce interference by solid testing. Don’t test biased participants; using the same customers over and over means they know your organisation and will taint the result. Test in real environments; testing a retail solution in a lab environment will not give the same result as testing it in store. If it is a mobile app, run the test on a mobile device. Testing a “blow up” version on a laptop is no substitute. Test with the right number of people – cohort analysis (people with shared characteristics) only needs 5 people. Testing with more people will only give the same results. It takes a lot of time and effort to conduct testing and bigger groups take longer, time needed for development. Ensure goals are mapped to the vision, if not they are a distraction and not moving your transformation forward. Ensure goals are linked to the drivers of the organisation’s success. Goals checklist. Ensure goals are mapped to the vision, if not they are a distraction and not moving your transformation forward. Ensure goals are linked to the drivers of the organisation’s success; what is the biggest influencer of revenue or loss in my organisation right now? Ensure goals can be measured against the 5 points of evaluation criteria; customer value, competitive advantage, technical feasibility, business impact and scalability. Ensure goals be applied at all project phases and beyond; at Prototype as well as Alpha and Beta. Ensure goals are measurable and empirically testable and finally leave the “how” open to the cross-functional team to describe i.e. flexible for the team to customise. Establish minimum success criteria. What is the lowest pass rate allowed? What is the maximum resource allowed? Budget, resources needed, costs in the business to incorporate the change in the business. What are the known constraints? Digital Transformation management is a way of working compared to traditional project management. Planning Gather detailed scoping over months, Senior leadership signs off, budget, time and deliverables. Suppliers quote on scope, responding to their portion of the work. Subject matter experts (internal and external) collaborate to determine the best way to meet the desired strategic outcomes. They quote on the first iterative stage project. Delivery Developed in linear stages by different teams, doing their part of the project. They pass their output to the next team to do their part. Success of the efforts can only be done when the overall project reaches completion. Project is completed in iterative cycles by internal cross-functional people and external specialists. The entire team is accountable for producing a testable outcome for each stage. Management Project managers track risks, timescales and costs. Record tasks falling below and report progress to senior leaders. When a task has fallen behind significantly, senior leaders determine a course of action and hand it down to the team responsible. In addition to risk, timescales and costs, project managers work in with the team to mitigate barriers. When a problem is identified, the team decide a course of action and give to senior leadership to endorse. Testing Testing/Quality checking is done at the end, thus there is an additional phase called testing. The product is not released until testing is finished and signed off. Testing/quality checking and bug fixes are done throughout. Launch Project publicly launches and issues arise that did not arise in testing. Project is mostly already released when it gets to final launch. Evaluation Team evaluated against deliverables, timeframe and costs in the budget at the end of the project The live solution moves into next phase/cycle of enhancements. Team evaluated against business metrics such as sales increases. Leaders are there to set goals and create an environment that enables team success. They are not there to show them how to do everything. Never plan in detail when you can build and test instead. You build for Customers, not the Senior Leadership/Board. Test and build with your customers. Deep planning to please internal people is a costly waste of time. Team consists only of the specialist skills dictated by the project. You need a small tightly aligned team without governance layers merely to coordinate communication between work streams. Digital agencies and staff can help fill capability gaps and sure you get the best quality skills you need. People on the team need to work collaboratively at every stage. This speeds decision making and can do the work immediately. Be strict about capturing all insights and findings in order that they can be applied elsewhere. Senior leadership sponsor must be in place: otherwise, the project teams will never get past the barriers. Senior leader will approve any additional costs or resources and remove barriers. Team members must agree the goals and minimum success criteria: the project team needs to have input to the minimum success criteria and the senior leadership owns the decision. Format/timescales of review must be agreed: there need to be fixed deadlines for iterative projects to meet. Deadlines are stop points to review and determine how to next proceed not arbitrary cut-offs to finish a piece of work. Team members must be properly equipped: the basics such as equipment such as devices, computers, office space, good video conferencing and online collaboration tools for the team. The team needs proper space to enable collaboration. A single location for the core team is important. Ensure a budget for equipment is at team level with each member accountable. This avoids high pizza bills and pool tables appearing from no-where. It is too easy to spend other people’s money! Each team member must be personally motivated to achieve the project goals: this includes accountability at team member level for achievement of project goals. Incentive drives success. Give the team access to needed experts – skill sets will be missing as the team is small. The team will need access to either internal or external experts. The project manager will be the first port of call for expert requests. Failure through trying ideas and failing is to be encouraged. Failure through breakdowns in communication, process or execution are there to be drilled down on and fixed. Without attaching blame. First; trying an idea that fails – this is to be encouraged. Second; Breakdowns in communication or process – errors in execution, general system failures. For all of these get to the root cause (use the team and the 5 whys) and define a fix. Laying blame will lead to risk avoidance by team members moving forward, killing the speed and effectiveness of your project. A blend of methods can be used to run iterative projects. Agile and Design thinking are the ones most used. Agile is the most commonly used process for iterative projects. Pure Agile was designed to develop software and therefore often needs customisation. Most commonly people learn Agile concepts, methods, principles and then customise to their organisation. Design Thinking is a methodology used throughout a transformation project, putting the customer at the centre of everything, designing solutions on what the outside world wants rather than what the organisation wants to provide. It is a method that allows a cross-functional team to plan design and build complete versions of a product in each stage of a project (known as a sprint). Sprints usually last 2 weeks and are managed and planned by getting the team to break down all requirements into small chunks called “User Stories”. User Stories are written from the end users’ perspective. Each new feature is captured as a User Story which becomes part of a prioritised list – a “Product Backlog”. User stories in the backlog constitute the total requirements of the product and represent the current state of requirements documented for the product. Well defined and important User Stories go to the top of the list. Each finished User Story is a completed piece of work that has been tested with customers and can go to Alpha and Beta for testing. By completing User Stories, the team can keep moving through the Product Backlog until the list is exhausted. Agile is the best project method for facilitating collaborative working and effective teams. Power is in the team, empowerment and accountability are optimised. Governance is made more effective due to shared accountability and transparency. It easy to accommodate change and sustain the product once the project is finished. The Product Backlog is easily maintained, and it is easy to add User Stories. Agile is a great method for facilitating collaborative working and effective teams. Design thinking is about putting the customer at the centre of everything we do. Discover: Focus on understanding needs and wants. Later in the project, Discover will be used to understand the usefulness of the product for customers. Define: Identify needs, pain points wants of customers for the benefit of the team. Capture and prioritise by using customer journey maps. Ideate: Develop creative ways to solve the pain points, wants and needs identified in Define. Repeating Ideate at each stage of the project refines product, keeps alignment with customer needs. Evaluate: Test the solution. Methods include Guerrilla testing; the team go out and test a solution with the public on a device. Why adopt design thinking – what do I get? A great way to develop ideas that will truly transform your organisation: Taking an outside-in approach really challenges your business model, processes and products/services. A plethora of tools and techniques for creative problem solving: it is not a fixed set of techniques. It is a like open source; growing and offering more tools every year. It is a movement not proprietary or owned by a company. It prevents tunnel vision – Using it at each stage of an Iterative project keeps the team open to new ideas from the outside, preventing blindness to new options and keeps solutions relevant. When an iterative project shows sign of success, we are ready to leverage that success. When you have a successful project, check the detail of your vision and amend if nuances arising from the successful project make that necessary. This keeps vision fresh and relevant. Results achieved in the Iterative projects offer an opportunity to progress your Digital Transformation. For example, something achieved in the Customer Service area could expand to other areas. Capitalise on project success. Use project results as leverage: show the tangible results from a business perspective; including profit increases and new revenues. Demonstrating results builds general pride in the company and is just showing how great the project team is. Demonstrate via results how the project was faster/more effective vs prior methods. Compare project statistics from the iterative project and a project that used traditional methods. Use team achievements as leverage: these are important, they show the benefits of the project in terms of greater productivity and efficiency, less effort and more job satisfaction. Team achievements are compelling for other people. Demonstrate how the design elements were more effective than prior projects. Show how collaboration led to achievements that are better than before. Demonstrate how Morale improved statistically; fewer sick days, less time spent on supervision, more effective governance, faster turnaround times. Show any first-time achievements or first time as working in a new way and new customer groups engaged with or new insights from customer groups not known before. Use project results and team achievements as leverage to attract more resources and expand the projects. People with a vested interest in working in the old ways: show them how in a non-threatening way. Ramming your results down their throats will lead to sabotage. Unmitigable barriers – eg. a digital platform that does not integrate is a barrier to offer online services at scale. The initial project will be deliberately simple and stand-alone to ensure there is something to show. Integration is a known and necessary step. Leave to the next stage as it is an unmitigable barrier at the start. Risks of major change: major restructures and other changes will threaten your transformation. Continually listen and adapt to changes where relevant or else your major changes will not work. Start big, bold projects: Cross organisation projects need leverage to make them happen and proven ideas from iterative projects will help them to start. The second type of big bold project changes the organisation in a big way i.e. moving from selling one-off transactions to subscription-based models. Scale to new markets, location or business areas: Any new offering you have developed needs to be tested in new markets. Use past successes as leverage internally go to the place you should deploy next. Go to the next place that buys into the idea. Attract new talent and high-value partnerships: Build internal skills and capabilities in Digital ways of working/technologies. External change means you need this capability and you can attract better partnerships if you have some capability yourself. Choose your audiences carefully: select measurable goals, engage with them in ways appropriate to them. It may be that you need a specific manager to provide resources or another to provide influence. Choose well. You may need People, Resources (equipment, money), Access (permissions to access customers or others), Buy in (support for business cases). Be effective in engaging people: be consistent and prominent in how you engage (i.e. a single email address for the project), have a clear call to action, be relevant to those you engage. Assign resources and ownership to make it happen: ensure you have leaders accountable for delivering components of the transformation. Use an iterative approach to test methods: all organisations are individual. Each will have best ways to engage internal audiences that fit the organisation. Think of them as customers in terms of customised approach. Learn why other projects failed: learn why unsuccessful attempts did not work. Which barriers blocked a project? Use official recognition: awards, stories, recognition in high profile places. Undertake presentations: roadshows, talks, presentations, all about the project(s). Ensure the roles in the team where aspirational but achievable. Cover how the project(s) relate to the audience’s area so they can see what the impact would be if they started a similar project. Create shareable assets: videos, case study write-ups. Include some entertaining material within the content. Make videos short. Shareable assets will effectively communicate what the projects are all about and how they are working. Ensure they are cleared for external consumption as they will be leaked. Run events: hackathons, drop-in sessions, workshops and tours Match the event to the audience. Hackathons are for technical people for example. Create collaboration spaces: online forums and blogs. Physical collocation spaces can be an area in the office. These make the calls to action and purpose really clear to all. Beware self-praise when promoting project results externally. The aim is to demonstrate to your customers that you are hearing them and adapting to their needs. Audience goals are more straightforward than internal; the calls to action can be more direct as the politics is not as important. Be ready to anticipate/prevent internal backlash: a purely external focus will leave internal staff feeling left out as they read about the external engagements in the press rather than hearing about it via internal presentation. Be ready to counteract added competition and external scrutiny; real performance improvement attracts imitators. Competitors may market more or even cut prices to meet the new threat you represent. Run promotions: show how it benefits the audience, not a self-congratulatory “look at us” show. Run events: research the one that brings in the precise audience you are trying to attract. Undertake articles/interviews: be as targeted as possible when choosing where you want your success to be seen. Think about how permanent the public record is. Create digital assets: well-designed video and material is great if the material is excellent. Otherwise, it will be ignored. Use HR: current job ads, information used to recruit people all can show you are working in a different way and will be noticed by the market. Customers are employees too and they will see what you are doing and the type of capabilities you are attracting. It is tangential evidence of your transformation. The purpose is to drive data-driven ways of working and decision-making into business. The aim is to connect to customers and the outside world thereby adapting to change and opportunity in the external market. Also, to collaborate effectively to produce great results and finally to achieve collective goals that drive internal and external gains and help drive the organisation’s mission. In digitally native organisations staff are empowered to adjust the organisation to customer needs. The Leaderships job in these organisations is to stay out in front and spot upcoming threats and opportunities and bring in new talent and specialist skills as required. Digitally native and Digitally transformed organisations are “bottom up” in style. This facilitates change to happen easily and quickly. Top down management control needs an organisation’s leadership to spot changes communicated upward via reporting, interpret actions and send out instructions. Once those instructions have been carried out and results occurred and feedback given, then the organisation can see if it made the right move. This process is simply outdated and slow. In digitally native organisations staff are empowered to adjust the organisation to customer needs. The leadership’s job in these organisations is to stay out in front and spot upcoming threats and opportunities and bring in new talent and specialist skills as required. A flock of sparrows will change direction instantly to the threat of an eagle. One sparrow moves, triggering a reaction from the rest of the flock. Each sparrow knows just how much to move and maintain distance from each other. This is the output of a complex adaptive system not a single dominant bird. It is the ultimate bottom-up adaptive model. Implement Universal goals: they incentivise collaboration and eliminates competition. Drive real-time, relevant feedback: by the time you have created a report it is out of date. Real-time feedback loops help people adjust their actions and behaviours. Track behaviours of customers test new solutions and monitor reactions. Think of “googling” real-time data with the query you want right now rather than waiting for reports that date as soon as written. Simple processes and specialist skills: enable the opportunity for people to act independently whilst keeping within the intent of the group (like the individual sparrow). The more descriptive and detailed the instructions/processes then the more likely you are to create robotic teams. Flexibility encourages initiative. Trait Traditional Orgn. Transformed Orgn. Universal Goals incentivise cooperation Leaders: create different goals for each area. Staff: Only work hard enough to not be criticised, stay in confines of your silo’s goals. Leaders: reward cross organisation behaviours. Staff: Work hard to achieve overall goals as it gains them reward. Cooperate with others outside their skillset as helps achieve goals quickly. Simple processes and specialist skills to enable achieving goals Staff: work to complex processes. Work in fixed roles and hierarchy. Manage and oversee all day to day activities including approvals. Leaders: allow staff to self-manage and self-organise. Staff: self-manage by following simple processes that achieve the organisation’s mission. Real-time feedback loops to enable agility Leaders: briefed on internal performance and external opportunities from traditional reports. Staff: handed information by leadership on a need to know basis. Feedback given in annual HR driven performance reviews. Leaders: connect to changing information flows and feedback. Enable the organisation to adapt to real-time change. Staff: connect directly to relevant data flows. I.e. customer feedback. Disseminating transformation is about embedding the principles that allow your initiative to have success. Successful dissemination will see more people to WANTING to work in a new way. The organisation’s common goals must resonate with people and be mission led – how will the achievement of the goals achieve the organisation’s mission? The goals must be linked to customers changing behaviours and needs. Prove your support for innovation: Experiment with new technology. People need to see what support is in place to help them achieve their role now it is more flexible. The support must answer: how do I access equipment, developers, designers. How do I get training on Agile, Design thinking? How do I engage customers? Think about the authorisation and access you will give people. Establish authorisation by formalising approval for doing cross-functional work. Simplify processes for working with external parties. Ensure that processes are in place that when success is achieved recognition is rewarded/communicated. Establish access and tools and resources for innovation. They may be centralised in an innovation lab or digital hub. Ensure individual recognition and accountability: People Need to know that if people put in more effort, they will be rewarded. Innovation is hard work so track and reward contributions. Track individual contributions by using the iterative approach – each team member is responsible for a part of the project. This must be measurable and so the employee can have a measure of what they contributed to an iterative project. Reward hard work – and have innovation metrics in each person’s individual plan. Remove silos – scale the iterative team model: Cross-functional teams work better than departments of people with similar skill sets. When teams are the right blend of skills, they are better equipped to achieve goals. Build adaptable processes: Make accessible the elements that made the solution successful to help new teams; processes, libraries of assets; code libraries, document templates and more. Train: When the team is ready for it or it will be wasted. Create open communities: ensure those interested in building their skills can interact with peers who have the relevant skills. Leaders need to have the courage to make the strategic investments that will make the transformation work. Leaders need to have the courage to make the Strategic investments that will make the transformation work. This includes major platform upgrades that enable real-time data gathering and analysis. People and new skills: deciding which staff changes are needed. I.e. changing an outsource team to be employees. Automating and enhancing processes: this is the first investment to make, then tackle hierarchy – the signoffs and unneeded hurdles. Forge new partnerships: find new technology partners you don’t yet need but will become very useful. Start with the iterative teams: those already working on transformation projects. Build on those teams. Customise iterations to the nuances of your organisation and understand approaches used by other successful organisations. Flexible systems are needed for each digital discipline. Examples of flexible systems are systems for Customer Experience, Design, Devops and insights (see table below). Legal and security: specific legal/security parameters you must stay within. This varies with your IT policies and regulation in the industry. Apply to the iterative approach you are employing. Values and culture: how your organisation wants to be perceived by the market. Often corporate values are in corporate speak and could in use by anyone. So, it is around aligning your projects to what the values really mean. Identity and Brand: how the organisation wants to be perceived and what should we must ensure is embedded in all interactions with customers. What is the personality of the organisation? Flexible systems are about more than the IT: they reflect the needs of a market and how the organisation will react to change. Specialists and team members must be involved: Involve the team in establishing systems. Systems are toolkits/resources to support the iterative teams and they must be vested in them. Don’t plan too far in advance: create the systems needed for your immediate innovations, not the whole transformation. Flexibility comes from open/modular frameworks: each part must be standardised and flexible. Consistency comes from standardisation: this allows your teams to customise for their projects. Standardising is not about prescribing everything, it is identifying the core principles. Flexible systems need to be in place and have Customer Experience, Design, Devops and Insights in scope. Customer experience Engage with customers to understand pain points. Engage with customers at each iterative cycle. Create user flow diagrams to help developers. Tips and processes for incentivising and helping users. Subscriptions to software for testing simple prototypes. Access to an online platform to share user flows across the organisation. Design Translate ideas into visuals. Interpret the brand into interaction behaviours and layouts. Ensure finished solutions meet design standards. Templates and guidelines for creating storyboards. Shared asset libraries and guiding principles for brand elements. Licences to design software. Software for creating user interfaces and animation. Platforms to host masterwork and processes for quality checks/updates. DevOps Identify right technologies to enable solution. Write code to enable features and functions. Work with existing IT platforms to deploy new solutions quickly. Libraries for code sharing, communities for support. Platforms for processes for documenting features and bug fixing. Software, environments and standards for testing and deploying and hosting new solutions. Insights Monitor real-time data and detect changes in success of existing offerings. Gather and interpret results from effectiveness of new offerings. Assess the wider market to detect signs of change. Customisable dashboards to monitor live data capture. Software, process and guidelines to capture test data. Subscriptions and access to online platforms that can monitor external organisations to monitor for change. This Executive Summary has been brought to you by Neil Rainey of The Digital Transformation People. A writer of summaries, Neil’s mission is to tease the wisdom from books into a few pages. Public vs. Private: Is Procurement Any Different? Is your customer experience ‘Ritz Carlton & Zappos’ or ‘nPower’?